CSFB is 20! Milestones are important because they give an organization the ability to look back, quantify successes and consider change for the future. Students have a better chance of getting into more selective Baltimore City Public High Schools or the private high school that is best for them. And, the bottom line? For 20 years, data clearly illustrates that our scholars are succeeding in school and in life. Data from BERC (Baltimore Education Research Consortium) supports the fact that funding from CSFB doubles a low-income student’s chances of graduating from high school. Tuition-assistance in K – 8th grade makes a TREMENDOUS impact on the lives of those we serve. 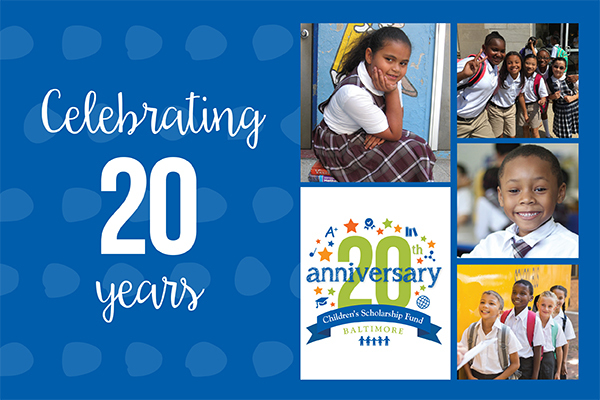 Follow CSFB’s 20th-year Anniversary celebration on social media by following the hashtags #CSFBis20 and #CelebrateCSFB.